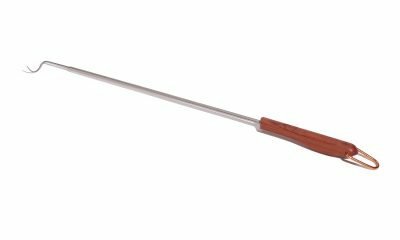 The barbecue hook with rosewood handle from by Outset, has a hardwood handle and a seamless stainless steel tapered shaft. 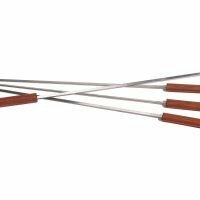 The pointed end on this barbecue hook curls around allowing you to hook meats like steak with a simple flip of your wrist. Due to the design of these products they are made to be used by right-handed people, lefties find them awkward to use. 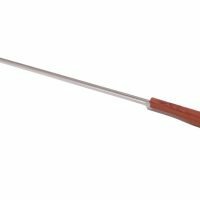 Overall length is 20 inches 5.5 of that is the handle.This longer version of the barbecue hook is more popular than the shorter version. The added length gives you a little more leverage on a large piece of meat. 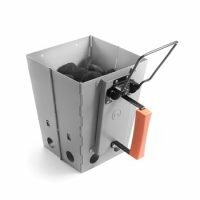 It is great when cooking over large commercial grills as well. To use your barbecue hook you simply place it onto your meat with the point down. With your hand gripping the handle, turn your wrist under. This will push the pointed end of the hook into the meat. Then lift slightly, to turn your food and turn your wrist back. It only takes a minute or two to get the wrist action down and once your good at it you will be able to turn your food in the blink of an eye. 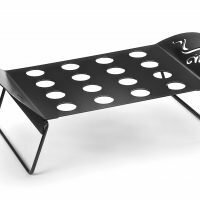 Not only does it look cool when your using it, it also speeds up flipping meats on the grill. 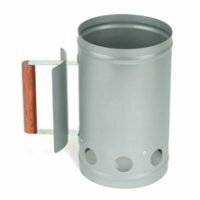 You can use it with almost anything (not delicate items like burgers or fish) meats and veggies, great for cooking for large crowds. The extra long 20 inch reach will also keep you away from the heat. 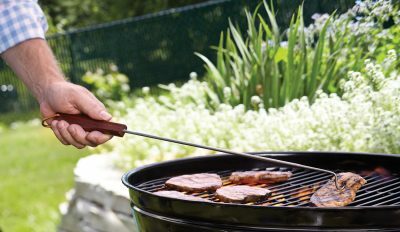 Clean-up of your barbecue hook is a breeze: Since you only use the tip, just swish it around in soapy water and wipe clean. Watch out for that point though, you could pierce something you don’t want to if you’re not careful. 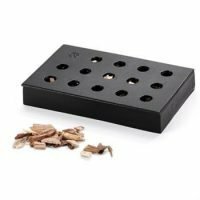 These tools have a great and loyal following online and every year we get people who order 6 or 12 at a time for gifts.